Thanks Josh. 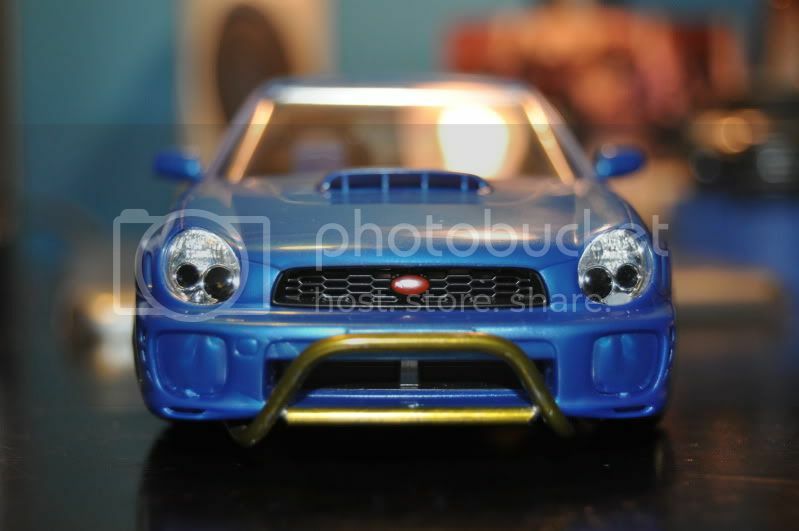 For some reason the computer took the pics off the camera in the wrong format. Some of them work when posting, but that pic was one that didn't. I'll have a pic of the frnt of the car in the morning. Oh my bad, my phone doesn't do hyperlinks only image tags. Pretty nice too, I like how the body keeps the car with a standard length to it even though its extended. Yeah. I have done other model conversions before, but this one is the best looking out of all of them. Last edited by pinsk17; 04-20-2010 at 11:39 AM.. The rear seat was ****ing me off. That's why it's not in yet. The nos bottle is in a temporary spot. I just put it there to get it in. The pic with the body on will come in the morning. I can't upload it from my phone. Hey I gots a question. 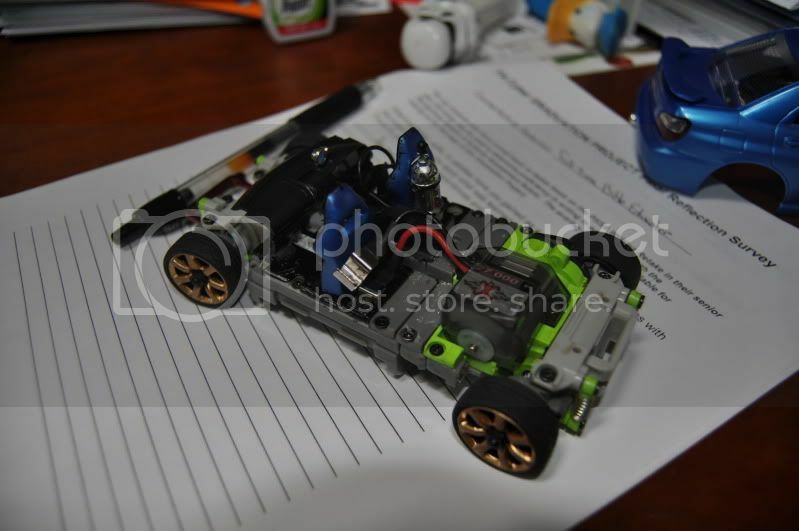 I was looking at the pics and noticed your motor wires. Is the passenger seat covering the port for the wire? It was when I took the pic. Its not anymore though. Good eyes Josh. Okay sweet. any plans for the performance? Lithium, chili, AWD, lights, and underglow. I do not know how I missed it before, but nice work on the front bumper/guard. It's looking very nice. Thanks man. I am going to be doing roof racks with the same material. But I am finishing another project first. The emblem that came with the car was a blk sticker, which I didn't like, so I painted it red. I'm still not sure about the nos bottle. I finished fitting the back seat and there is not much room so the bottle will go in another project. I have the light kit already and everything I need for underglow. Thanks for the offer though. It's the first full-interior that I've done, so I am very happy with it. 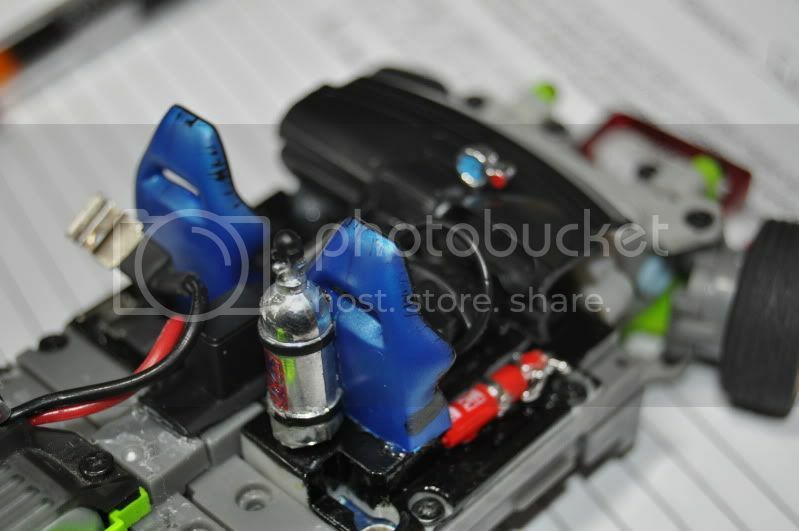 I just have to figure out how I am going to get the motor wires to the ports. I will probably have to drill holes in the seats. Very nice project. Great job on the details. Never was a fan of the bugged eye subby though. Can you post a close up of the front mount? After seeing Winner's and your project thread, I went to look for the Revell Sub kit. No luck on that though, but found something else. I would like to use you mounting config cuz it sits so nicely. Never was a fan of the bugged eye subby though. 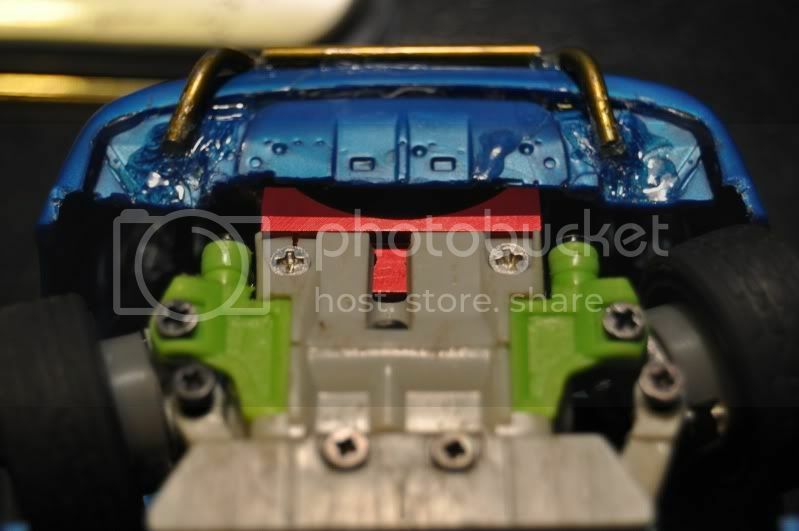 The model kit had two holes in the front of the bumper where the bottom of the car would mount. 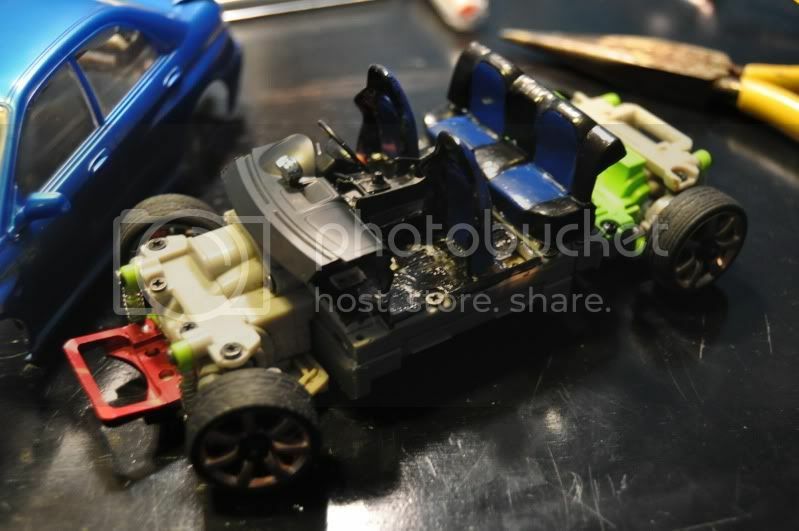 What I did is cut the frnt part of the chassis part and glue it to the car. 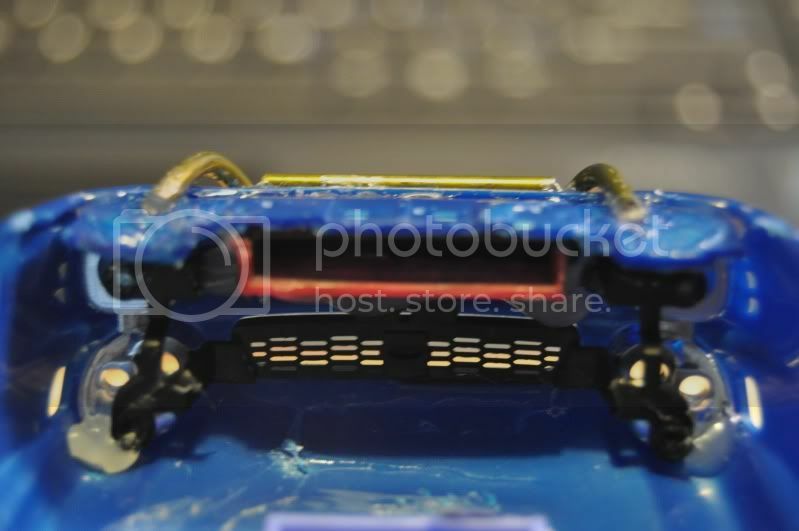 Now I'm not talking about the frnt of the xmod chassis, but the frnt of the model chassis. After that I just mounted a front clip port from a supra bumper and positioned it till I likeed the stance. It was very simple. I will still put up a pic to show you exactly. When you get your model, if you need any help mounting the body just pm with any questions. I'll be more than happy to help out a fellow xmoder. Last edited by pinsk17; 04-26-2010 at 04:47 PM..